Lots of cool new tech to play with when it comes to software-defined storage models. Decoupled control and data planes (for compute/network/storage) - and control planes (which control policy) that are pure software. The control plane abstraction enables abstraction, pooling, automation. It's what ESX does for compute, NSX does for network, ViPR does for storage. Data planes (in storage land - these are the things that persist data and offer data services) that increasingly - wherever they can - are implemented as pure software (and therefore offer different deployment models - software + COTS or Software/Hardware appliances). Everything being driven programmatically via APIs. Things like VSAN from VMware (great for all-VMware use cases), or EMC ScaleIO (targets larger scales - up to 100, even 1000's of nodes - and multiple different use cases - including VMware) are examples of #2. I'm seeing more, and more customers (including some big ones - see AT&T's view here - which is focused on SDN, but trust me, they are applying the same pressure on the storage domain) that want software + bring your own hardware models - which is exciting! EMC Scale IO is currently GA (v1.0) - and the 1.2 beta (more data services, specifically snapshots, native windows support on top of linux) is open! You get access via this application form. APPLY!!!! VSAN is also in a public beta, and VMware has stated a "1H 2014" target. You get access via this application form. … And, we are counting down the hours to the ViPR GA date (which will be the industry's first software-only, open, accessible, extensible storage control plane). If you're like me, you spend a fair amount of time looking at esxtop data. There's a really great post that just went up on the VMware communities I think is just fantastic if you are looking to interpret results and wanted to share! BTW - Happy new year to all - and here's hoping that 2009 is filled with peace, happiness, surprises, and interesting challenges for us all! Scads of posts I've been contemplating over the holiday, chomping to get back in business! 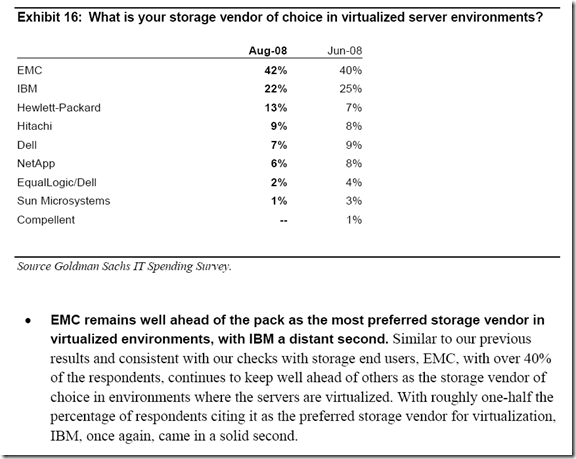 Does VMware DPM shorten ESX server lifespan? "Does the Distributed Power Management power-on/off cycle cause the boot LUNs of the ESX servers to fail prematurely?" BTW - if you're not a DPM expert, this video highlights it's incredible promise (it's currently an experimental feature in VI 3.5). The answer in a word? NO. DPM does not shorten ESX server's lifespan due to drive failure. If you're interested.... Read on! I've been tearing my hair out with a future build of ESX for a couple of weeks. Now my system is decidedly NOT on the HCL. It's one of my home-grown ESX 3.5 u2 systems - an Intel G33 motherboard, Q6600 CPU, 8GB of RAM, bunch of Intel 1000 Pro GT NICs. To boot, I've been using an old-school QLA4010c (thanks qlogic for sending me the new QLE4062s and the cool 8042 10GbE converged adapters!). OK - this system boots FINE under 3.5u2, but under... let's say... ESX.next, not so much. NOTE - we're talking pre-release here, so don't extrapolate ANYTHING from this. During install, it would hang while loading the network drivers - I eventually isolated this to the Intel GT cards. PTs, OK. MTs, OK. Interesting. ?If I don't disable the onboard NIC, same deal - hang during install. They all use the e1000 driver, but mental note - I'm using MTs and PTs going fwd. the internal SATA controller looked like it installed fine, but then looked like the MBR wasn't configured right - at the end of install, the HDD wasn't bootable. I found this long ago with non-supported controllers, so poked around with this. So, the QLA4010c (and this seems to be true with the QLE4062 too) boot from iSCSI SAN wasn't working right (BIOS loads, drives found, but don't show in the install screen). I poked, prodded. I tore my hair out. I was stuck with no bootable controller/drive combo, and was considering a trip to Fry's for another MB whose SATA controller I would know would work (an older nvidia MB for example). I've used a bootable USB ESXi 3.5 image on my laptop, and suddenly thought - "why don't I just do that?" A few minutes later with DD for windows and the dd image I had my ESX image on USB. So, why am I so pumped on this? It's more powerful than immediately apparent. Portable. I'm carrying it around with me now and am doinking around with ESX.next on the road on my laptop. Compatible. All those driver issues I was struggling with? NON EXISTANT this way - I've got my iSCSI HBAs, my NICs, and I'm up and running. Nothing earth shatteringly new here, but rather a real "aha" personal moment where the power of this technology and approach. I'd strongly recommend that anyone out there who manages a VMware environment play with this. If you're used to installing systems off DVDs, you might just find yourself considering a new way. SVVP - how does it work? There's been some good discussion around this today, and it was good, tomorrow am some official language will come out that will be along the clarifying lines in the body of this post. Remember, just because I post it doesn't make it official, it's not official until it comes from VMware. But, this should elucidate things a bit. Ok - open standing proposal... First some history... EMC has a long experience in working specific customer configurations through the Windows Server Catalog. Getting MSCS configs certified historically (it's recently gotten a lot better, thank goodness) was BLACK AND WHITE. Only that EXACT configuration was supported. For many people this was a deal-breaker. Over time we got really good This turned out to be a good thing for MSCS as a whole, when you're building these mission critical config, support testing We became a machine at doing this. Want a fun proof point? 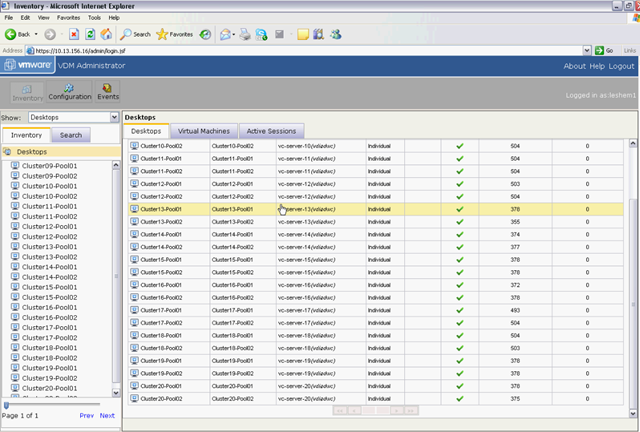 You can see that we've done this A LOT - just about half the MSCS configs are on EMC. OK - here's the open offer - if you are a customer, and the only thing stopping you from adopting a joint VMware/EMC solution for your Microsoft apps is a specific gap on the SVVP that matches you, post your needed config as a response to this thread, I'll work with VMware to get it up there. 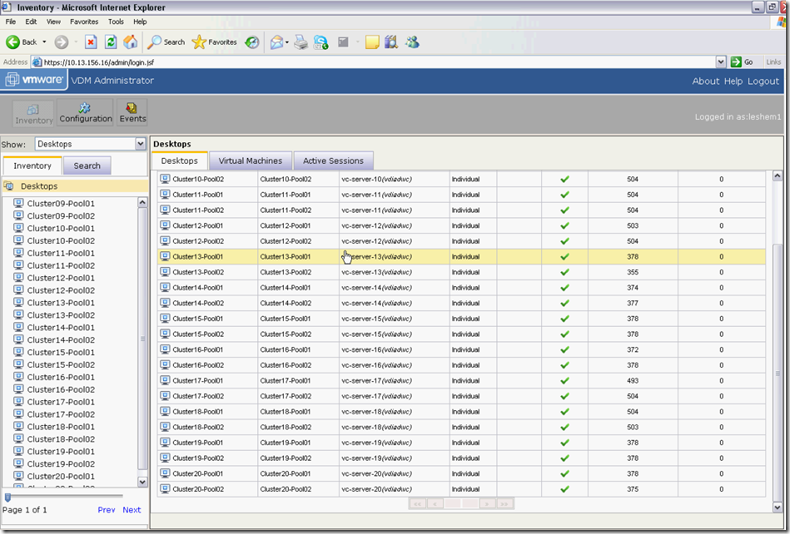 I'm that sure that virtualizing wth VMware is the right thing for customers - I'll get YOUR config tested. We do have experience on getting this sort of thing done fast. Ok - for some Q n A - read on. So, what does vStorage really mean? Pretty big day here at VMworld, meeting lots of people I know only online - which is great. My photo is in the about section of the blog, and if you'd like to meet me, I'd love to meet you! So - the VDC-OS is the big news, let me fill you in on one part of it - vStorage. vStorage has been something that VMware and EMC have been working together on for a long time, in fact, before it was called vStorage (which was recent) - it used to be called VMAS a name only engineers would like. In fact, we've been working on this from almost right after the original acquisition before the program even existed formally. This was the first idea from eons ago. Customers know the pain VMware multipathing can be - setting up static paths, manual "load balancing" by rotating primary paths, and no automated path discovery.... you know what I'm talking about.... But we needed to find a way that we could get PowerPath, which is the far and away the leader in this space, into the vmkernel, but still make it open for others to also innovate with VMware. 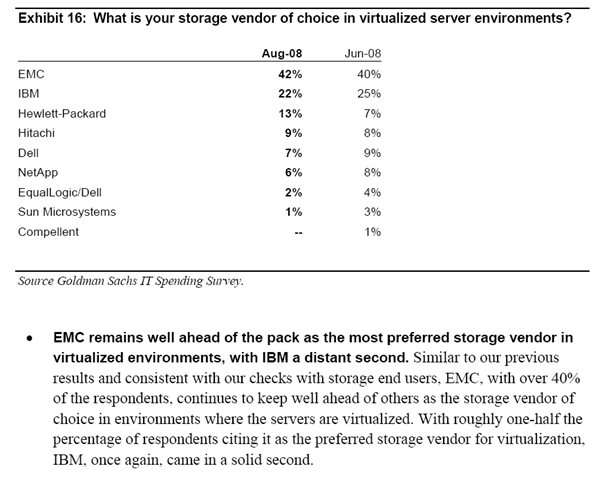 It so happens of course that EMC are the ones way out in front here. It's also simple, and easy to use and install. It just works, like the best technology does. BTW - we're accepting beta sites now, and it's going to be HUGE for any VMware/EMC customers. download a hi-rez version here. Also as part of this, some things that have existed before are getting clarified. vStorage Virtual Appliances now formalizes a program around VMware Ready appliances that perform storage-related functions. Celerra VSA freely available – iSCSI, NFS - public and free! Cool stuff we've been working on to help customers, I'm glad to share the news! As we get in to the final stretch of preparation - I'm really hoping to see you there. I really hope you'll come to all our sessions, we're trying our best make them pertinent, technical, filled with demonstrations, disclose current and future capabilities, and share customer deployment experiences. In the booth, we'll be distributing best practices and virtual appliances you can use, demonstrating solutions from VDI to SRM, Management integration, powershell scripting, VMware integrated VM-consistent array replication that simple and easy to use, and loads of other fun stuff, some of which I can't talk about until Wednesday. If you haven't yet registered, it's getting close, but you can still squeak in - click on the graphic below. FYI - I've posted my current calendar (I arrive on Saturday and leave Friday), hope to see you in some of the sessions! if you want to see my schedule, read on!